12 Days of Christmas With VTech! Plus the Most Thoughtful Grandparent Gift! I have been compensated by VTech for my participation in this campaign as a part of the Mom It Forward Blogger Network. As always though all my crazy opinions and stories are my own. 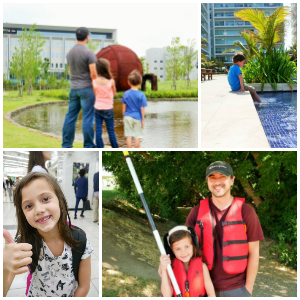 Time goes by so fast, I look around and it seems like my kids are getting bigger by the second and the years pass by so fast. I think we sometimes forget to look outside our immediate family and take a closer look at elder family members and their needs. 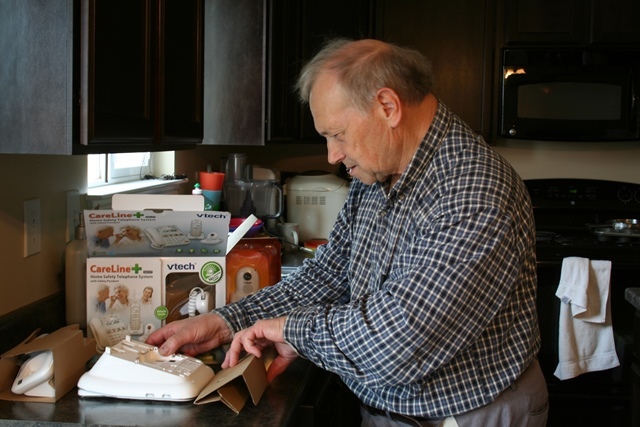 For grandparents and elderly parents their needs can change drastically with every passing year. I find it hard to come to terms with that sometimes and have to remind myself that they are getting older too and need certain tools set in place to help them out. 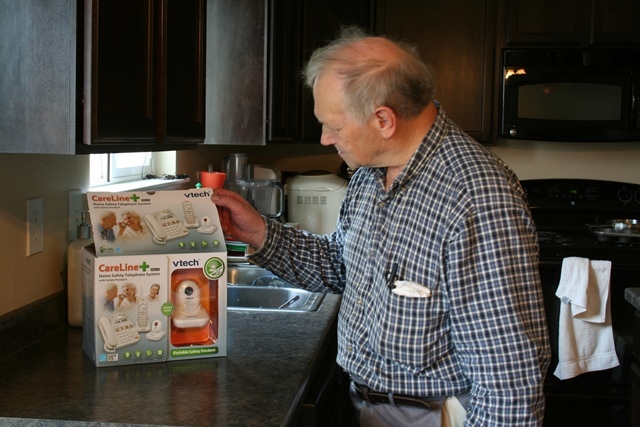 An amazing tool I recently came across is the VTech CareLine, I found this to be a fantastic system that not only helps grandparents keep in touch with friends and family, but also provides some pretty cool safety features as well. I have a grandmother that has been loosing her sight since I was a child and is now legally blind, she can only see a very narrow field of vision and I know this will be the perfect gift for her this Christmas. 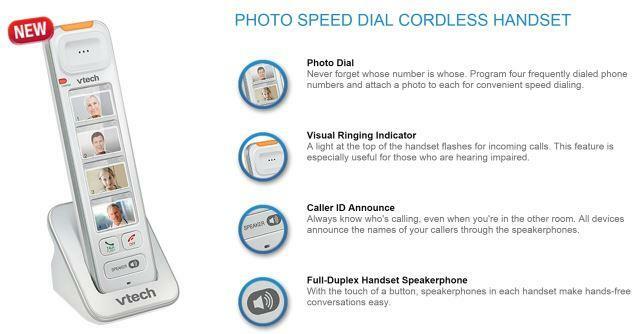 The phone system comes with big picture photo dial, this means you can put the photos of those you call the most or maybe just all the grandchildren right their on the phone easy to see and you can be talking to them with just the push of one button! With my grandmothers sight fading this will be a feature that will help her out so much, even when her sight is completely gone she will only need to touch and push one of those four buttons and will be instantly connected to her loved ones. But even better than that is the Portable Safety Pendant that will help you in the event of an emergency. I think we have all seen the Life Alert commercials or other commercials like it that boast a pendant or button system that will alert 911. Unfortunately some of those systems can have a heavy price tag or monthly fees that can add up quick. The VTech Careline comes with a pendant that comes with no extra monthly cost or fees. With a push of a button she can contact emergency services or she can contact a family member or friend. I love that it doesn't have to be programmed just to dial for 911 sometimes you might have an emergency that a friend or family member can help you out with that doesn't warrant five emergency vehicles showing up at your doorstep. The phone I received for this review I gave to my father in-law to use and to get his thoughts and opinions on it, and the longer I watch him use it and discover all it's pretty neat features the more I realize what a great fit it is for even more of my extended family members. My father has had hearing aids for a while now and I know the Amplified Sound and the Audio Assist would be a great help to him. Now before I get a angry call from my parents... let me clarify they aren't elderly in the least, but you don't have to be elderly for this system to be a great system for you! I bet right now you can think of several family or friends this would be great for. I know a few people with children that have medical issues and sometimes those few seconds of running to grab a phone to dial 911 can make all the difference. Having the Portable Safety Unit for a family with medical concerns would be a great asset. Be sure to also check out all the amazing Amazon reviews of the product! It got four stars! 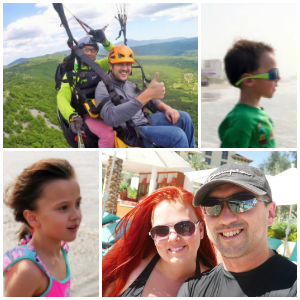 Also be sure to check out these other wonderful blogs that are participating in the VTech 12 days of Christmas! Good luck and may your holidays be merry and bright!